Habitat: Desert, Upland, Riparian. 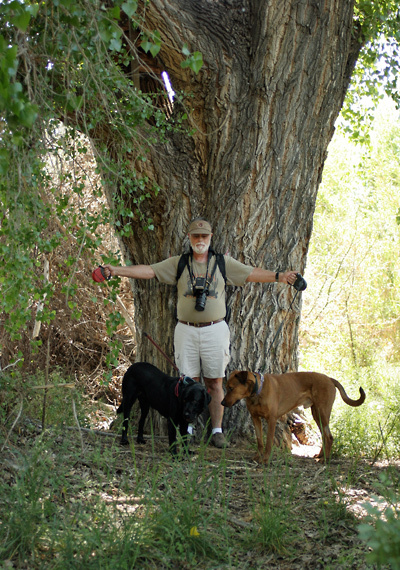 This large, deep-rooted tree grows in washes, canyons, and bottomlands with surface or at least subsurface water. Description: The trees are dioecious, so the male and female flowers are on different plants. The inflorescences are slender, dangling catkins with small flowers. The female flowers are followed by seed capsules containing fluffy seeds. The seeds are tufted with long, white, cottony hair and are dispersed by the wind. The leaves are simple, alternate, petiolate, bright green, up to 3 inches (7.6 cm) wide, and triangular-ovate in shape with coarsely toothed margins. The leaves turn bright golden yellow in the fall. The bark is tan to grayish tan in color and has deep vertical furrows. These trees can grow to be very large, with trunks reaching or even exceeding 5 feet (1.5 m) in diameter. 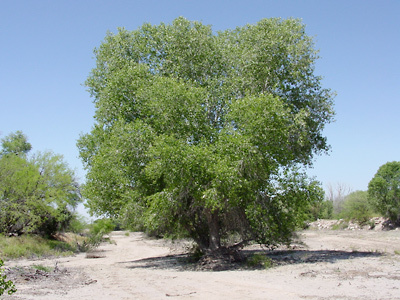 The other Populus species found in southeastern Arizona are quite different from this species. 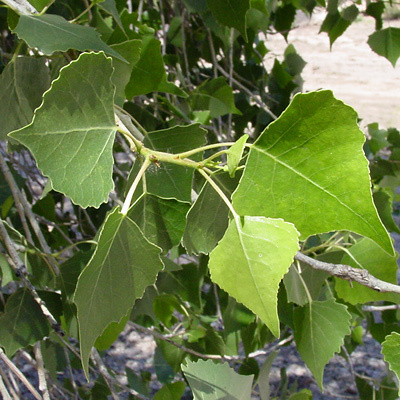 Narrowleaf Cottonwood (Populus angustifolia) has narrower, lance-shaped leaves, while Quaking Aspen (Populus tremuloides) grows at higher elevations, forms colonies, and has a slender growth form. Culturally Significant Plant – Native Americans used the sap and inner bark for food, the twigs and roots for basketry, and the leaf buds and bark for medicinal purposes. This plant contains salicin and populin, which are precursors of aspirin. Edible – The sweet, gummy, starchy sap and the soft, bitter inner bark are edible either raw or cooked.